Updated. A rainy or snowy day in New York City can pose a few challenges for seeing the city, but many attractions are indoors. The subway may be the best and most convenient means of maneuvering New York City in disappointing weather. Locate a subway stop near a favorite shopping destination, landmark, or a museum, and you are good to go. Here is a list of recommended subway stops in or near a major NYC attraction. 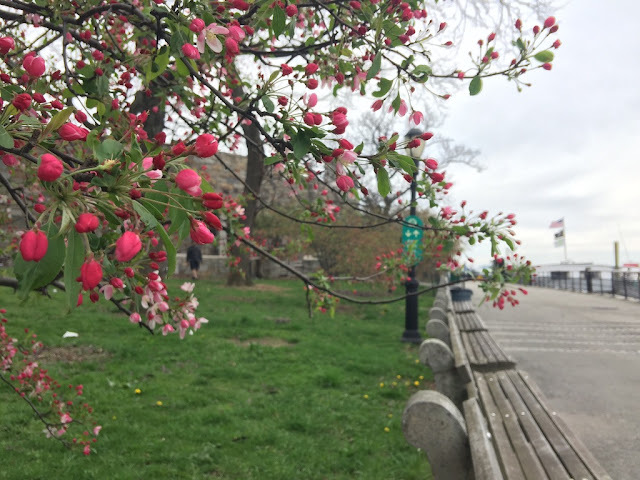 • Eastern Parkway-Brooklyn Museum 2, 3: Just outside the Brooklyn Museum. • Bowling Green Station, 4, 5: Near the main steps of the National Museum of the American Indian (the former Custom House). • W. 4th St., A, B, C, D, E, F, V: There's always a movie. The IFC Center on 6th Avenue shows the best of independent film. 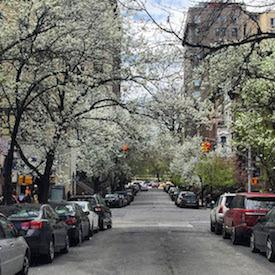 • W. 14th St. A, C, E. Make a mad dash west to Chelsea Market on 9th Avenue between W. 15th and W. 16th and go on a food spree. • 34th Street-Herald Square, N, Q, R, W: Go straight to the Manhattan Mall and shop. Macy's is very close. • 34 Street-Penn Station, 1, 2 , 3, A, C, E: Penn Station isn't beautiful, but you'll at least find shopping and food. 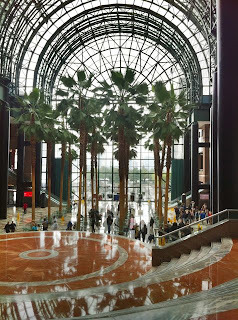 • Brookfield Place (left), near E, N, R: With indoor shops and restaurants, views of the World Trade Center site on the east, and scenes of the Hudson River on the west, Brookfield Place is a good place to wait out a rainy day. While there, look for the new PATH station concourse. The concourse leads to the inside entrance for the One World Observatory at One World Trade Center and the WTC Path Station. • 42nd Street-Bryant Park, B, D, F, V, 7: Just steps from the famous lions gracing the steps of the New York Public Library. Check out the special exhibits, or bring your laptop to the renovated Main Reading Room. • 42nd Street- Port Authority Bus Terminal, A, C, E: Stores, restaurants, and a bowling center with a cocktail lounge. Yes, hipsters, the Port Authority Bus Terminal is your place to be. • Times Square-42nd Street Subway Station. The busiest station of all. 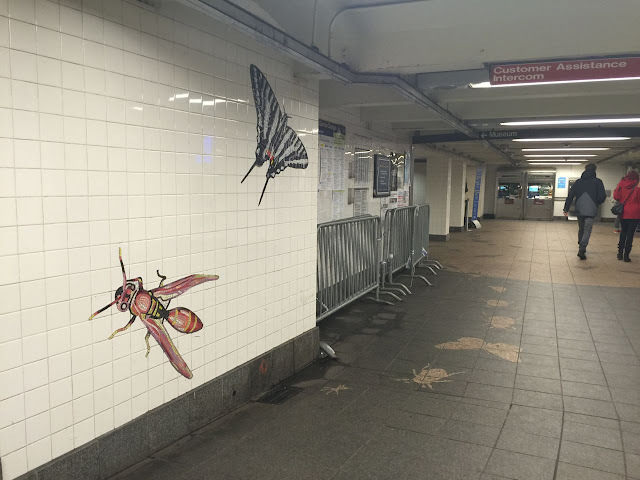 Artwork by several artists, including Roy Lichtenstein, Jane Dickson, Jacob Lawrence, and others make this subway stop a destination underground. A good place to listen to free live music. 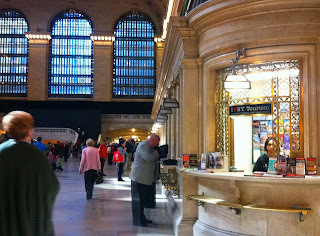 • Grand Central - 42nd St., S, 4, 5, 6, 7: In addition to the amusements of watching people come and go inside a spectacular building, the shopping is convenient. Browse the satellite shop of the New York City Transit Museum, get something to eat in the food mall, or dine at one of the nicer restaurants. If you get really bored, you can take a Metro-North train somewhere, like Beacon (Hudson Line), Croton Falls (Harlem Line), or New Haven (New Haven Line). • 47- 50 Sts- Rockefeller Center Station, B, D, F, V: Rockefeller Center, Top of the Rock, Radio City Music Hall. • 5th Avenue, E: The Museum of Modern Art (MoMA) on E. 53rd St. is less than block away. • 57th St. - Seventh Avenue, N, Q, R, and W: How do you get to Carnegie Hall? This way. The stop is just outside the famous concert hall. • Lexington Avenue-59th St., N, R, W or 59th St-Lexington Ave Station, 4, 5, 6: Bloomingdale's, the famous New York department store. • 59th St-Columbus Circle, A, B, C, D, 1: The Museum of Arts & Design (MAD) and the Time-Warner Center. 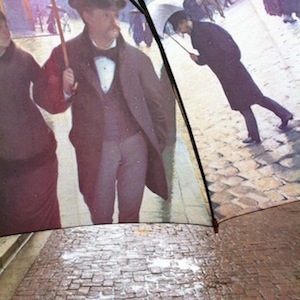 • 66th St.-Lincoln Center, 1: So it's raining or snowing. Enjoy a ballet, symphony, opera, play, or film at Lincoln Center. The 81st St stop at the American Museum of Natural History provides direct access to the museum. • 81st Street-Museum of Natural History, B, C: American Museum of Natural History. Walk straight from the subway into one of the greatest natural history museums in the world. • 110th St. Cathedral Parkway, 1: Cathedral Church of St. John the Divine. Visit the wonders of one of the largest churches in the world. Explore on your own or on one of the regular tours. • 157th St. This subway stop was constructed back in the day for its proximity to the historic museum collections in Audubon Terrace. 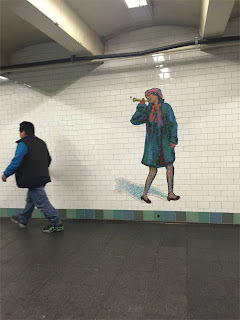 The MTA's art in the subway program is one of the great pleasures of the metropolis. See this page on their website, MTA - Arts for Transit / The Official Subway Art and Rail Art Guide. There, you can download a copy of the guide to the artwork in each station and peruse information and beautiful pictures about the artwork and installations. The MTA website also provides convenient directions with their Trip Planner. Also, think about getting on a MTA bus and seeing the city that way. Check out New York on one of the buses that runs the length of Manhattan - the M1, M4, M5, for example.